"Red-rood" redirects here. It is not to be confused with redroot. Cornus sericea, syn. C. stolonifera, Swida sericea, red osier or red-osier dogwood, is a species of flowering plant in the family Cornaceae, native throughout northern and western North America from Alaska east to Newfoundland, south to Durango and Nuevo León in the west, and Illinois and Virginia in the east. It has sometimes been considered a synonym of the Asian species Cornus alba. Other names include red willow, redstem dogwood, redtwig dogwood, red-rood, American dogwood, creek dogwood, and western dogwood. In the wild, it commonly grows in areas of damp soil, such as wetlands. It is a medium to tall deciduous shrub, growing 1.5–4 m tall and 3–5 m wide, spreading readily by underground stolons to form dense thickets. The branches and twigs are dark red, although wild plants may lack this coloration in shaded areas. The leaves are opposite, 5–12 cm long and 2.5–6 cm broad, with an ovate to oblong shape and an entire margin; they are dark green above and glaucous below; fall color is commonly bright red to purple. The flowers are small (5–10 mm diameter), dull white, in clusters 3–6 cm diameter. The fruit is a globose white berry 5–9 mm diameter. The Latin specific epithet sericea means "silky", referring to the texture of the leaves. Cornus sericea is a popular ornamental shrub that is often planted for the red coloring of its twigs in the dormant season. The cultivars 'Bud's Yellow', 'Flaviramea' with lime green stems, and 'Hedgerows Gold' (variegated foliage) have gained the Royal Horticultural Society's Award of Garden Merit (confirmed 2017). Like most dogwood species native to North America, C. sericea can be parasitized by the dogwood sawfly, possibly leaving much of the plant devoid of leaves. A variety of pesticides are effective; however, hand-picking the larvae is also an option. C. sericea is frequently used for waterway bank erosion protection and restoration in the United States and Canada. Its root system provides excellent soil retention, it is hardy and provides an attractive shrub even when bare in winter, and its ability to be reproduced by cuttings makes it a low-cost solution for large-scale plantings. Some Plateau Indian tribes ate the berries to treat colds and to slow bleeding. Known as cansasa in Lakota, the inner bark was also used by the Lakota and other Native Americans as "traditional tobacco", either by itself or in a mixture with other plant materials. Among the Algonquian peoples such as the Ojibwe, the smoking mixtures, known as kinnikinnick, blended the inner bark with tobacco, while more western tribes added it to the bearberry leaf to improve the taste. The Ojibwe used red osier dogwood bark as a dye by taking the inner bark and mixing it with other plants or minerals. Cornus sericea subsp. 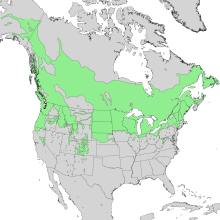 sericea – throughout the range of the species. Shoots and leaves hairless or finely pubescent; flower petals 2–3 mm. Cornus sericea subsp. 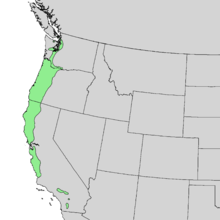 occidentalis (Torr. & A.Gray) Fosberg – western North America. Shoots and leaves densely pubescent; flower petals 3–4.5 mm. Cornus sericea L. has been recorded from counties Antrim and Londonderry in Northern Ireland. ^ "RHS Plantfinder – Cornus sericea 'Bud's Yellow'". Retrieved 30 January 2018. ^ "RHS Plant Selector – Cornus sericea 'Flaviramea'". Retrieved 16 June 2013. ^ "RHS Plantfinder – Cornus sericea 'Hedgerows Gold'". Retrieved 30 January 2018. ^ "AGM Plants – Ornamental" (PDF). Royal Horticultural Society. July 2017. p. 16. Retrieved 24 January 2018. Wikimedia Commons has media related to Cornus sericea. "Cornus sericea". Germplasm Resources Information Network (GRIN). Agricultural Research Service (ARS), United States Department of Agriculture (USDA). Jepson Flora of California: Cornus sericea; subsp. sericea, subsp. occidentalis.